Discussion in 'Guides' started by RGiskardR, Apr 20, 2018. LiveTcpUdpWatch is a free software program by Nirsoft that displays information about the TCP and UDP activity of any Windows device it is run on. 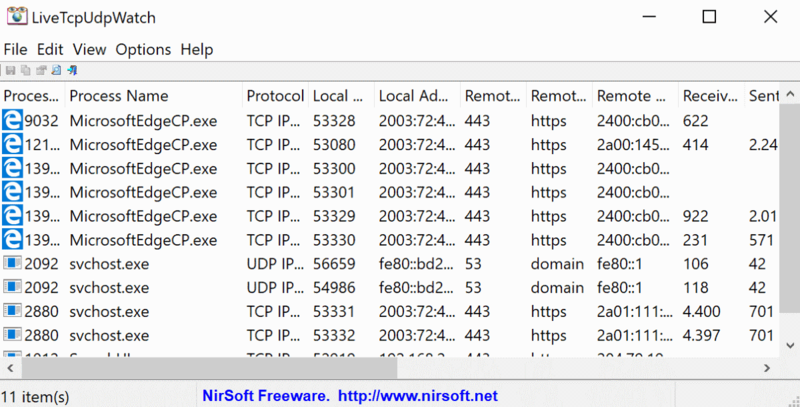 Windows comes with a handful of tools that reveal network activity; you may open the network tab of the Resource Monitor, or use the command line tool netstat to display open network connections using netstat -an (also available for Linux). LiveTcpUdpWatch is a portable program for Windows that displays live network activity. You may run the program from any location on Windows systems as it does not need to be installed and can be run right away. The application is compatible with Windows XP and newer versions of Windows, and is provided as a 32-bit or 64-bit executable.